For the last six years, the staff at our elementary school has worked to integrate curriculum across the grades to create two school-wide literacy sequences a year. The first one serves as a purposeful and fun way to bring the school together during the September start-up process. The second sequence has become a natural vehicle for creating a common focus to the learning and for facilitating connections (student to student, student to topic, class to class, teacher to teacher) across the school. 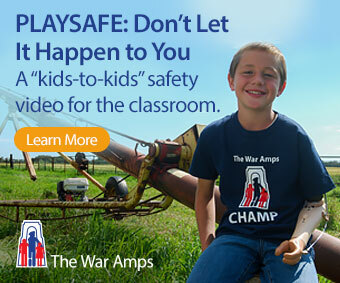 It has been our experience that school-wide themes are a powerful way to enhance learning in the classroom. The value of using a theme is not measured by the time involved, the number of subject areas that are integrated, or the relative merit of the topic; the value is in the learning that takes place. When a particular focus becomes an integrated, relevant, and connected learning experience for you and your children, you have created a theme. (Making Themes Work by Anne Davies, Caren Cameron and Colleen Politano, 1993). Behind a certain village lay a lake full of frogs. The chief ’s youngest daughter often went there alone to listen to their songs. But today as she approached, she heard no singing. She heard human voices instead. “Quick, let’s go. We have them all,” said one. “Now we are great hunters too!” boasted the other. “Who said that?” asked the girl, for she could see no one. The chief ’s daughter looked down to find a small frog in the tall grass. “Oh my! How is it you use human speech?” asked the girl. And so begins the adventures of a young girl of the Northwest coast. The edge of the lake lifts up and the girl walks under with her newfound friend. She finds herself at the bottom of the lake in a large deserted village. She is given a button blanket and enters one of the lodges to speak with the little frog’s grandmother, the Volcano Woman. She finds the grandmother is mourning the loss of her children and so the chief ’s daughter tells her about the two boys she had seen at the edge of the lake. As they speak the cooking fire burns fiercely and the floor of the lodge rumbles and shakes. Afraid for their safety, the young frog girl guides the chief ’s daughter back to the lake shore. But it was no longer still and quiet as before. Black smoke filled the air and thunder roared in the distance. The chief ’s daughter runs back to her own village only to find it is deserted. As she searches through each house for anyone who might have stayed behind, she hears frog voices coming from a bentwood box in the corner. She releases the frogs from the box and carries them back through the burning forest and returns them to the lake. As they slip below the surface, a heavy rain begins to fall. With the forest fire extinguished, her people return to their village. But it was becoming difficult to hear her. The frogs were singing again. This book was written and beautifully illustrated by Paul Owen Lewis. As it addressed the learning outcomes in so many areas of the curriculum and for multiple grade levels, our staff thought that it would be a great choice for a school-wide literacy sequence. • During the eight week block of time, each class read the story and engaged in the planned schoolwide activities. Some classes developed Science and Social Study units springboarding from the book, e.g. 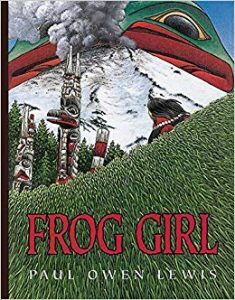 : myths and legends, frogs, life cycles, food chains, Northwest Coast aboriginal cultures. • Several classes made trips to nearby ponds to observe life in a wetland ecosystem. • An aquarium was set up and frog eggs were brought from a local pond. Students made observations and kept logbooks of the tadpoles’ development until they were released as adults. • Julia Joseph, a weaver who uses traditional methods to make cedar bark baskets, spent a day in the school. 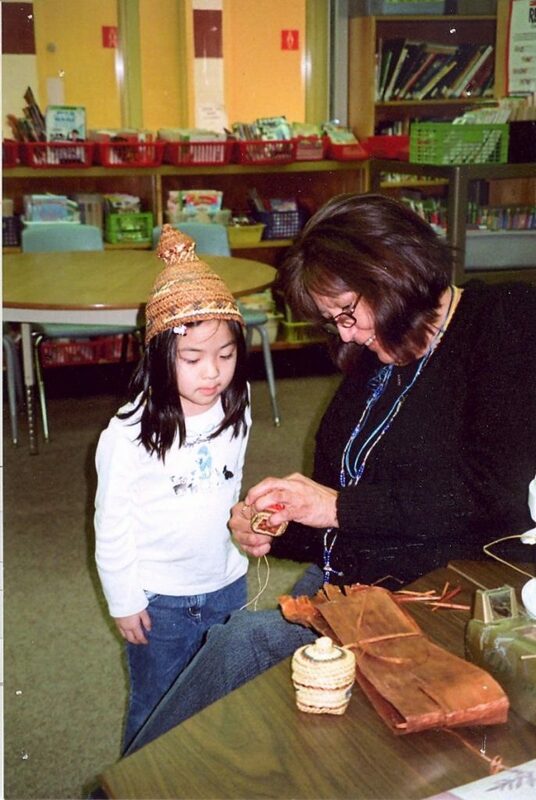 Each class enjoyed a half hour visit with Julia and watched as she created a small cedar basket that was left on display at the school. 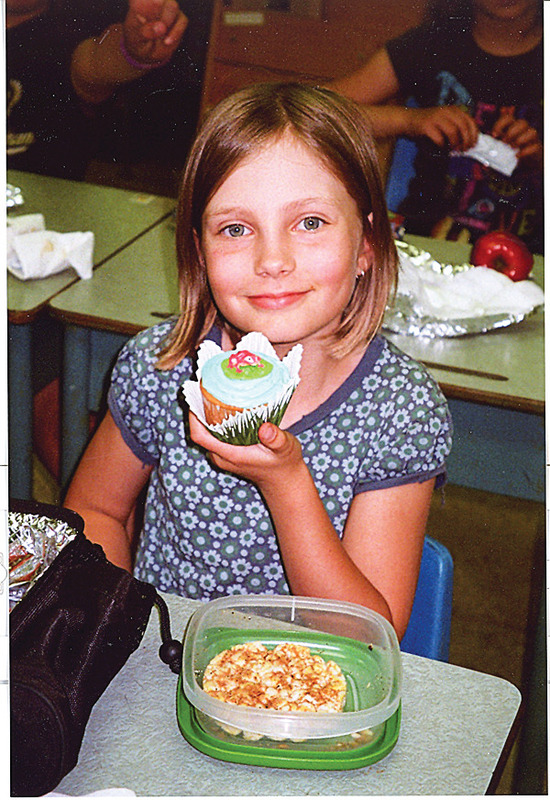 Frog cupcakes to celebrate a successful performance. • Cross Grade Grouping activities: our school regularly engages in cross-grade group activities. 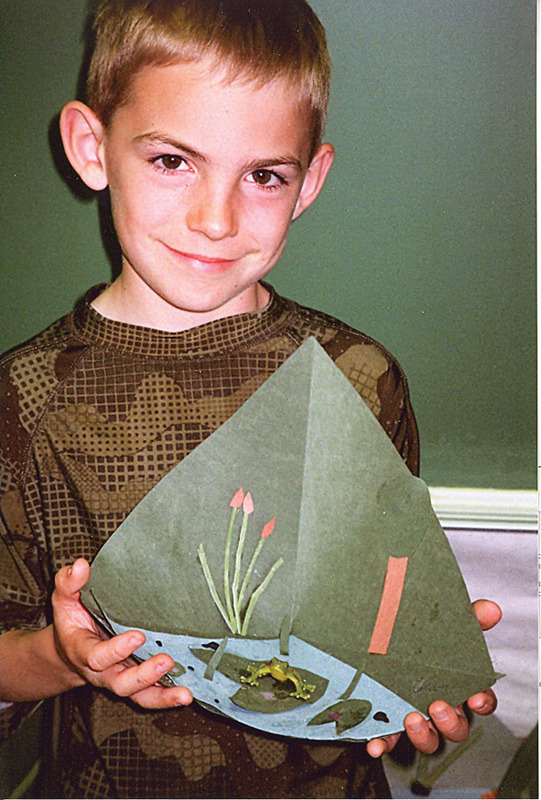 In this case, each staff member led a group of K – grade 7 students in a craft/art activity related to the book. These projects included printmaking, collage and mobiles. These items were on display in our hallways for the duration of the theme. • Solomon Seward, a carver who makes jewelry from copper and silver, spent the day in the school. Each class observed him as he demonstrated the use of his tools and spoke about the training he had undergone and where he gets the inspiration for his artwork. • We celebrated the closing of the Frog Girl theme with an assembly that featured the Grade 3 and 4 classes. Under the direction of the school music teacher, they performed an artistic interpretation of the book through music, song and dance. The students will accurately portray their knowledge of the early stages of the frog life cycle. 1. Look at and sketch the eggs and tadpoles observed in the aquarium, pond or available photographs. 2. 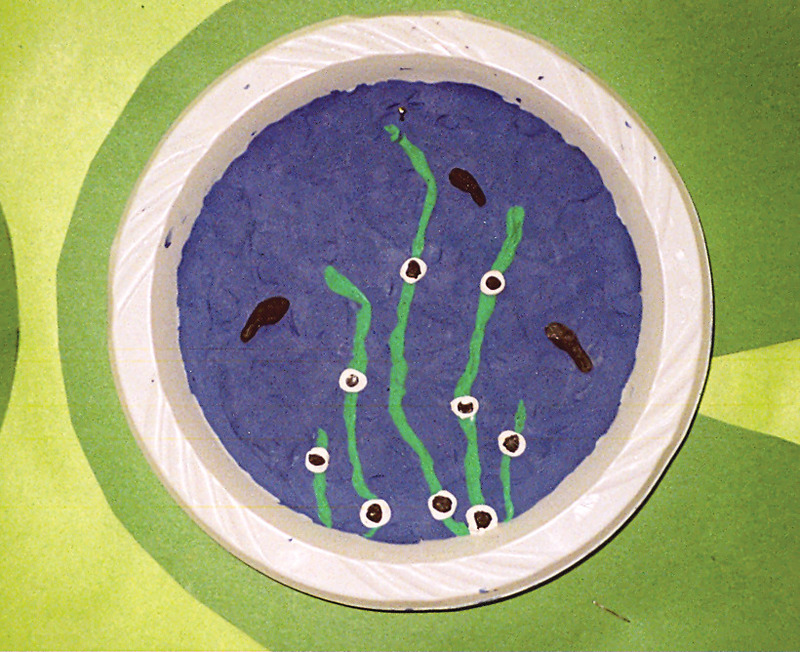 Completely cover the bottom of the plate with a thin layer of blue plasticine. 3. Press long strings of green plasticine for weeds onto the blue background. Flatten the green weeds with a finger or the eraser end of a pencil. 4. Add the eggs and tadpole details. Have the students do a “gallery walk” (walk around and look at the other pictures). Ask the students to try to find one picture that looks realistic and be prepared to share why it is with the class. 1. Talk about a recent trip to a pond, or look closely at some pictures of a pond habitat. 2. Fold the construction paper squares in half on the diagonal. Open and fold on the other diagonal. 3. Lay flat and cut from one corner to the center. 4. Use scraps of construction paper or crayons to create a pond scene on the top half of the paper. 5. Overlap the two bottom triangles and glue them together. 6. Add items to complete the habitat including paper lily pads, bullrushes, etc. Have the students share their models with a partner. Have them point out the most important details and explain why they are important to a pond habitat. The students will demonstrate their knowledge of a pond ecosystem by creating an underwater scene on a banner. 1. 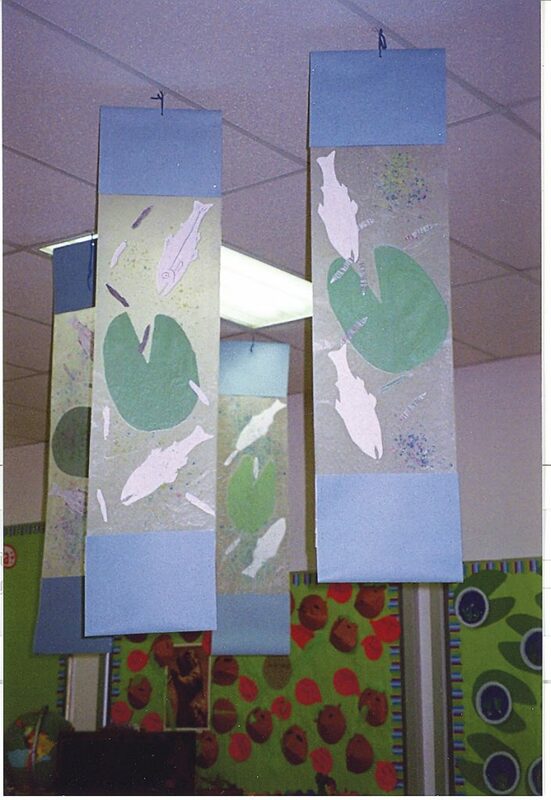 Have each student cut out a lily pad, some small fish and tadpoles from the coloured construction paper. 2. Store each student’s items (a paper clip or folded piece of paper will keep them together nicely) until s/he is ready to assemble the banner. 3. Place a thick layer of newsprint on a table. This will protect the table from the heat of the iron and will absorb some of the wax. 4. Tear off a piece of wax paper and place it on top of the newsprint. 5. Have a student spread his cut out items on the wax paper. 6. Tear off a second piece of wax paper and place it on top of the items. Check to see that the two sheets of wax paper are aligned and that the items don’t stick out at the edges. 7. Place one sheet of newsprint on top to absorb the wax. 8. Gently iron across the banner on medium heat. 9. Remove the iron and the top piece of newsprint. Check to see that the wax paper sheets have sealed together. If they did not seal it is because the iron was too hot (burned off the wax) or you held the iron in one place for too long. 10. Fold two pieces of construction paper in half. Staple each one over an end of the banner. This conceals the ends of the wax paper and adds weight so that it will hang well. 11. Punch a hole at the top and hang the banner. Discuss the role that the tadpole plays in the food chain in a pond ecosystem.